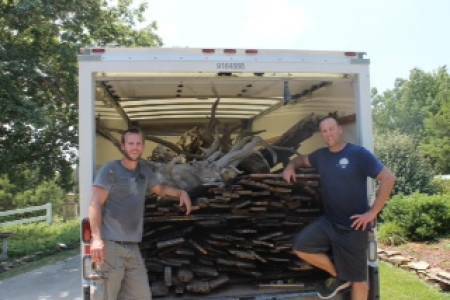 Burditt and Ray with a load of barn wood in Warsaw, Mo. MU Alumnus Ben Burditt, B.S. AgEcon ’00, has taken his passion for preserving history and working with his hands to the west coast. Burditt started furniture company Burdittray, with partner Jeremy Ray, in June 2012. The two joined together with a common vision: creating beautiful furniture blending vintage material with a contemporary/modern style. 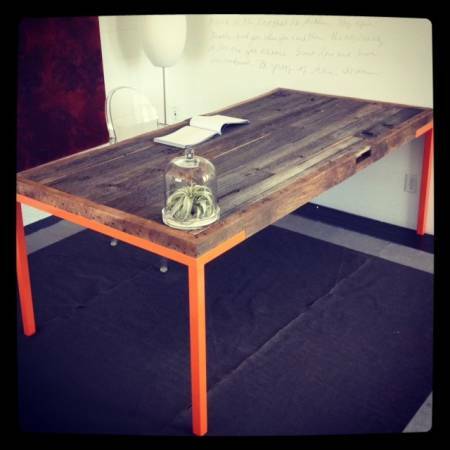 Burdittray sells furniture made out of barn wood from the Midwest. The duo travels around the Midwest, personally dismantling and then salvaging wood. Burditt’s path was not a straight shot after graduating from MU. He took time to enjoy life and find where he wanted to be. After graduation, Burditt stayed in Columbia for four years, working for a developer. He came to a point where he wanted a change. He went to visit his friend in California, and fell in love with the architecture. He decided to try his luck at it. He spent seven years doing general contracting, which he still does along with Burdittray. After playing around with furniture, he discovered an old barn back in Missouri, and thought it would be neat to make modern furniture out of it. Jeremy Ray also came from a small town and liked working with his hands, and admired Burditt’s furniture. The two went back to Missouri to get more barn wood and started selling some pieces. Soon after, the pair started Burdittray. Barns are dismantled by the pair and the salvaged wood is used to create each unique piece. The heritage of the wood and the added contemporary touch is the perfect blend of today and tomorrow. Burdittray named their first collection of wood furniture MIZZOU ROAD. A piece of Burdittray furniture was recently featured on HGTV on the “Celebrities at Home” program with soap star Galen Gering. 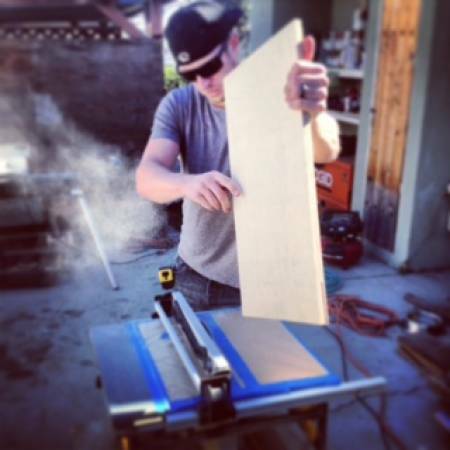 Burditt in the shop designing a piece of Burdittray furniture. Burditt lives in Los Angeles with wife, Krista, who works as a personal assistant for actor Gerard Butler, and son Avin, 2. They are expecting a daughter, Ella, at the end of April. He enjoys hunting and fishing, football games, playing with his black labs, and anything else outdoors. Burditt goes on a fishing trip with his father in Canada every year. He tries to make it back to Columbia every year for a football game. You can visit Burdittray online here.